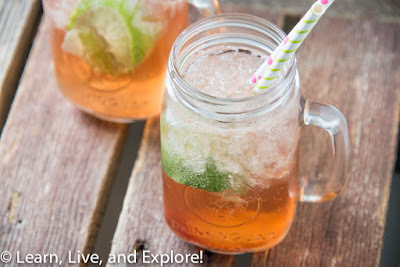 Summer Drinks: Recreating Sonic's Cherry Limeade ~ Learn, Live, and Explore! I am a sucker for Sonic Drive-In's Cherry Limeade. Even when I am not thirsty, if I see a Sonic down the road, there is an irrational pull that lures me there. Perhaps it is because I think of the drink as a novelty because there are no convenient Sonics in the DMV (that's DC-Maryland-Virginia metro region for you non DC-ers), so I feel the compulsion to satiate my craving whenever I can. Good news, now I can simulate a Cherry Limeade at home whenever I "need" one, and the next time I see a Sonic perhaps I will just drive on by. Who knows? 10-12 oz. Lemon-Lime Soda (Sprite, 7-Up, etc), so this is either half of a 20oz bottle or a whole can. Fill a large (16 oz) cup 2/3 full of ice. Confession: I LOVE SONIC ICE! Which, if you are not familiar, are the small round ice pellets that look like hail. I wanted an authentic experience, so I went to the local Jimmy Johns that has this ice in their soda machine and bought a drink, but left with just the ice! I know, so economical. Pour the lemon-lime soda into the cup, leaving room at the top. Squeeze the half lime on the soda, then drop the lime half into the cup (for authenticity). Add the cherry juice. The amount will depend on what you found in your grocery store. If it was cherry juice concentrate (what I had), use 2 tsp. If it is bottled juice (Juicy Juice), then use 3 Tbsp. Stir with a straw and enjoy!